With a total of 70 species, another below par month (an average of 72.5 in July over the previous ten years). 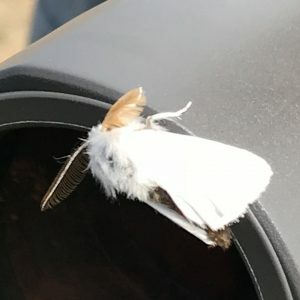 It was also the second month running that no new species was added to the year list and the total of 66 days without an addition, by the end of the month, was a new record. However, typical of July was the trickle of returning waders which included a few Green Sandpipers, lots of Whimbrel and singles of Bar-tailed Godwit and Greenshank. Thunder and lightning and a period of heavy rain from 7.15-30 am. Then it was sunny with a light SW wind. A flock of 15 Common Scoters flew east and four Sandwich Terns offshore included our first juvenile of the year. Waders included a single Curlew flying west and a Redshank and two Common Sandpipers on the beach. There were also five Little Egrets and an adult Grey Heron on the beach and four Herring Gulls sporting Pitsea colour rings were noted. Cloudy, moderste southerly wind with light rain showers. Six Whimbrel flew west, two Common Sandpipers flew south over the area and a Redshank appeared on the beach by the Obs late morning. A single Swift, two Sand Martins and Swallow flew west. A Stock Dove on the shingle ridge flew off south and was the first recorded here since April (they seem to be getting extremely scarce). Sunny at times but much cooler with a light southerly wind. Unfortunately, this change in the weather did not result in a change in our fortunes. A Whimbrel was on the beach, three Ringed Plovers and six Turnstones were scattered over the beach at low tide and a single Redshank was heard calling. 16 Swifts flew west and two Jackdaws on the football pitch were the first seen since mid-June. Sad to see that what is supposed to be our flower meadow (in front of the sewage works) has been mowed for the second time this season. Having recovered a bit from being mowed in May, there is now not a single flower standing! Is it simply that the contractors forget what they are supposed to do? 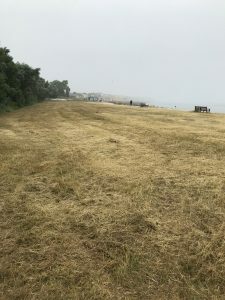 Last year, Andy was able to stop a contractor mowing this area but we can’t be on site 24/7. 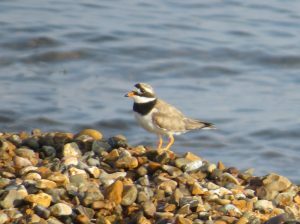 The heat had Andy heading home by 9.30 am but not before noting the increase in waders with ten Ringed Plovers, a Whimbrel, a Green Sandpiper and two Common Sandpipers, and eight Turnstones. A juvenile Green Woodpecker was doing a tour of the sites hotspots! 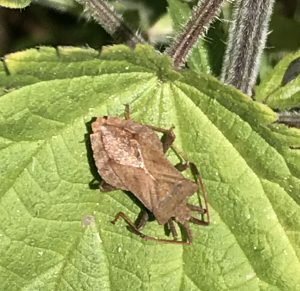 It is two months to the day since we added a new species to the year list. It is not, however, a record as none were added between May 22nd and July 26th in 2009 (a gap of 65 days). Nearly there though! Sunny and calm with an onshore breeze. There were five Little Egrets with three roosting along the east bank during the morning. A Grey Heron was on the shingle ridge. Wader numbers continue to increase with nine Oystercatchers and 14 Ringed Plovers roosting between the groynes including four juveniles. Single Whimbrel and Redshank were heard calling as was a flock of Turnstones, though only two were seen. A Green Woodpecker was calling in the churchyard and later one was seen in the trees along the upper brook. 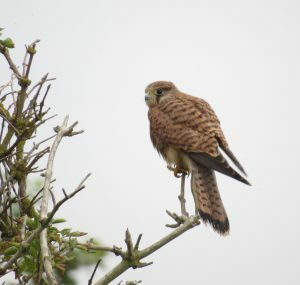 Only our second of the year but regular sightings will now be expected in the post-breeding period. Five Swallows were circling over the shingle ridge and the local House Martins continue to visit the beach to feed. Sunny with a light southerly wind and very warm. A developing onshore breeze cooled things down a bit. Just a bit! Three Gannets flew east and a Teal circled over the beach. Waders were on the increase with seven Oystercatchers, seven Ringed Plovers (all adults) and seven Turnstones (six still in breeding plumage) on the beach. A single Whimbrel and a party of 11 passed offshore. 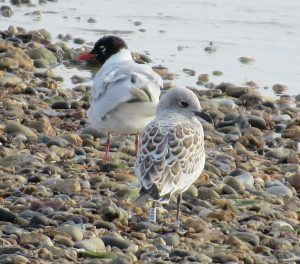 There were 17 Mediterranean Gulls, including eight juveniles, on the beach. Two Sandwich Terns flew east, five Swallows flew west and a Grey Wagtail was in the brook near the sewage works entrance. Sunny, calm, very warm. 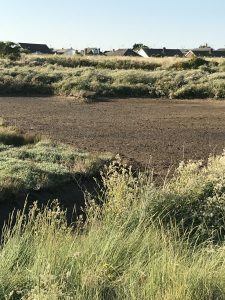 Waders included a Whimbrel and a Redshank heard calling, the latter our first returning bird, and two Green Sandpipers which circled over the brook and the Marsh Pool before disappearing over the beach. Eight Turnstones flew east along the beach. A trickle of vis mig with six Swifts, a Sand Martin and two Swallows, a Meadow Pipit (first since April now it is not a breeding species anymore) and two Yellow Wagtails, all heading west. The latest event in the “tidying up” of the churchyard was the cutting off of ivy at the base of two of the sycamore trees. Ivy provides many insects and nesting sights for birds and, later in the autumn, is often alive with Ivy Bees. Bad for wildlife, ugly and seemingly pointless! The Marsh Pool managed to attract one wader, a Common Sandpiper on 19th, before becoming completely dry two days later. Sunny with a light westerly wind. Five Gannets and a Gadwall flew west. Waders included a Whimbrel on the beach, a Greenshank, which dropped down towards the beach before continuing east, and a Common Sandpiper on the Marsh Pool (both first returning birds) and a summer plumage Turnstone. Seven Swallows flew west and two Yellow Wagtails were on the beach. Also, a Great Spotted Woodpecker was calling in the churchyard, a Grey Wagtail flew into the sewage works and a Buzzard was soaring in the sky to the SE. 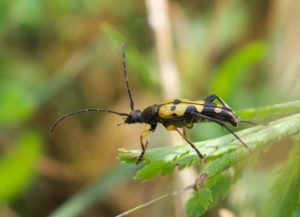 A male Brown-tail moth was not a surprise, given the number of caterpillars seen, but a Black-and-yellow Longhorn Beetle was a smart dude! Sunny, light westerly wind, warm. Two Grey Herons flew west, a Whimbrel was on the beach and ten Mediterranean Gulls flying west included three juveniles. 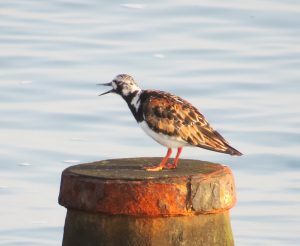 An adult Turnstone on the beach was our first here since late May. A bit of vis mig with 20 Swifts, four Sand Martins and six Swallows west. A Shaded Broad-bar moth was the first noted this year. A short visit for Ted before he was driven off by the heat. There were five Little Egrets on the Marsh Pool and two Whimbrel flew west. Ted Lee noted ten Common Scoters flying east, three Whimbrel flying west and 12 Mediterranean Gulls on the beach. Cloudy with a light northerly wind. A flock of 30 Common Scoters flew east, a Hobby flew west low over the scrub and there were three Curlews, two flew west and one was on the beach. A flock of 54 Carrion Crows was on the football pitch and feeding time! 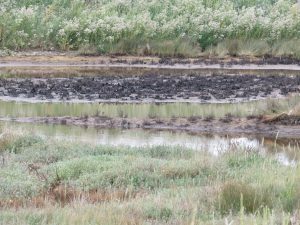 The Marsh Pool looks good for migrant waders at the moment but potential customers should hurry because, with this hot weather, it will not look good for long. Cloudy with a cooling NE wind. Three Curlews flew west accompanied by a single Bar-tailed Godwit. Five adult Common Gulls also flew west. There was a flock of 20 Goldfinches in the scrub including a few juveniles. Sunny with a light NE breeze and very warm again. A little more happening today with one Fulmar east, an immature Gannet, a Curlew and a Shelduck west and c110 Common Scoters, including one flock of 80, in flight offshore. Numbers of Mediterranean Gulls continue to gather on the beach; there were at least 11 today including our first sighting of a juvenile. 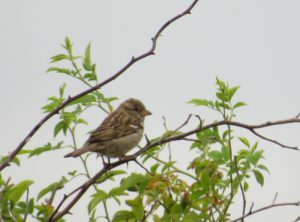 This individual was colour-coded and was rung as a chick at Antwerp in Belgium on 9th June (thanks to Camille Duponcheel for the rapid response). Two Sandwich Terns flew east, seven Swifts flew west, a Grey Wagtail was heard in the sewage works and a Lesser Whitethroat was watched as it delicately extracted insects from the head of an umbellifer opposite the Obs. Another Marbled White was seen near the Obs and a female Velvet Ant (Mutillidae) was seen crawling towards the Obs. This wingless wasp has a legendary sting which has earned it the name of “cow killer). Fortunately, your team escaped unscathed! Unfortunately, no photo of the Velvet Ant was obtained. My son has asked why the “Swalecliffe Birds” site is full of pictures of insects with the odd rabbit and cat thrown in. I told him it’s that time of the year! Sunny, a light NE wind and very warm. 15 Gannets flew east, a Curlew flew west and 11 Mediterranean Gulls were on the beach. Two Marbled Whites were at the Obs and the Lang Court rabbit was seen again. 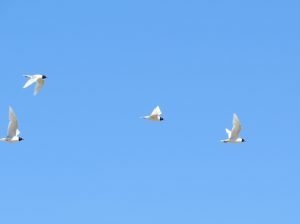 12 adults and two second-summer Mediterranean Gulls flew west. Light cloud, calm. A Hobby flew low over the wooden bridge by the sewage works entrance. Two Common Terns were offshore, an adult Cuckoo flew by the Obs, there were six Swifts, c10 House Martins over the beach and a Grey Wagtail. Our first gatekeeper of the year by the obs (21st species for the year) and another sighting of Ringlet. Cloudy with a moderate NE wind. Very little to report; a pair of Shelducks were on the Marsh Pool. 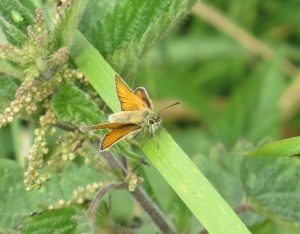 Our first Essex Skipper of the year was recorded along the middle brook and a Ringlet was seen again in the scrub. Sunny, moderate NE wind, warm. Two Gannets flew east, there were four Little Egrets and a Grey Heron on the Marsh Pool and six adult Mediterranean Gulls appeared on the beach by the skate park on the incoming tide. 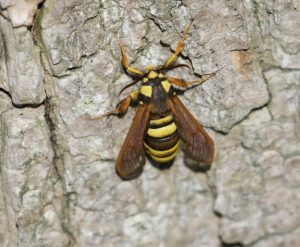 Andy Taylor found a pair of Hornet Moths on the poplar tree by Lang Court. 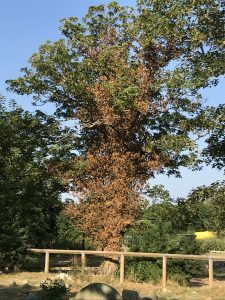 This was the same tree as last year but a bit later (24th June in 2017). 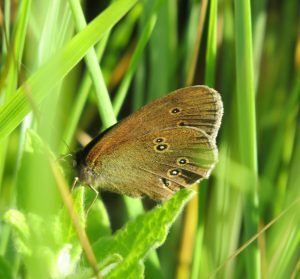 A Ringlet butterfly in the scrub was only our third record here with the two previous records many years ago. Other butterflies included Large White and Peacock, there were some Silver Ys, a Dock Bug and the first sighting of a Water Vole, near the lower wooden bridge, this year. Sunny, light to moderate NE wind, warm. An immature Mute Swan flew east over the sea, there were five Little Egrets in the area, including three on the Marsh Pool, and a Grey Heron was also on the Marsh Pool. 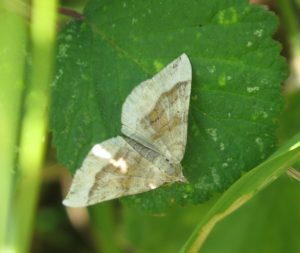 Butterflies recorded were Small and Green-veined Whites, Small and Large Skippers, Red Admiral, Meadow Brown and Small Heath. 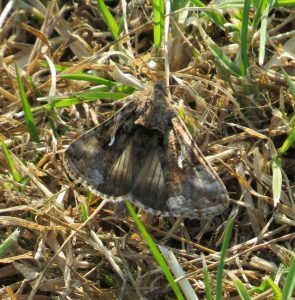 Also, in common with many sites, there were a lot of Silver Y moths about.